Valery Karankevich, candidate for Parliament running in constituency No. 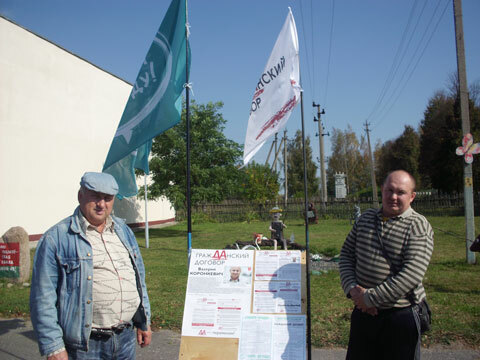 83, says his campaign materials have disappeared from a number of polling stations in Khotsimsk district. “On 19 September, we arranged a campaign picket in the agrotowns of Biarozki and Zabialyshyna, Khotsimsk district. After that, we visited five polling stations in the district, and none of them had my election posters. It is really sad that the campaign materials were posted by my election agents ahead of the early vote. I don’t know yet, but I am beginning to think that the elections should be boycotted, just like the BPF party,” says the candidate.